Before I get too far ahead of myself, let me explain a little background. A year ago I had never heard of Preston Reed. But I had started using Google+. I quickly discovered that this was an opportunity to engage with new people worldwide, based on shared interests. In particular, I could have live discussions face to face in Google+ Hangouts. One of the people I met, Catherine Maguire, is originally from Ireland and now lives in Scotland. Over time, I learned that her husband is a professional musician from the USA, and that she is his business manager. The first time I heard Preston Reed play (it was in a hangout) I was completely blown away. His guitar doubles as a percussion instrument and a lead and rhythm guitar. A lot of the time, both of his hands are over the top of the guitar, and a lot of the melody is carried via hammer-ons and pull-offs. So Preston and Catherine needed a video for their Indiegogo campaign. We suggested that if they could put together some kind of script, and Preston could be interviewed on camera to bring out the talking points from the script, we could edit together something that looks and sounds fairly natural. Then if we could get our hands on some of his concert footage, that would give us a music bead and enough b-roll to make it really nice. The concert footage was the easy part, he already had a few YouTube videos out there. 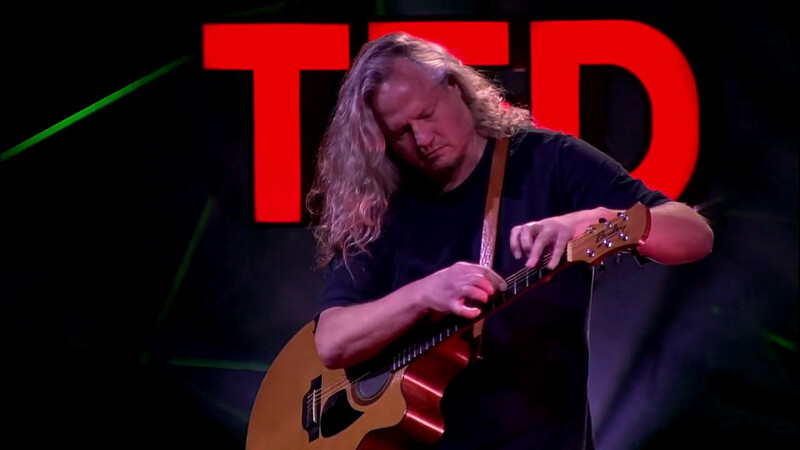 In particular there's one of him playing at a TEDGlobal talk (he got permission from TED to use this). The on-camera interview turned out to be a lot trickier. The closest thing to a video camera they had was a webcam. Preston decided to sit in front of the webcam and give the script content a shot. After lots of takes, he still wasn't happy with his delivery. It's not like playing the guitar. There are a number of us who regularly hang out with Catherine, and I think it was Ayoub Khote who suggested that we get Preston in a hangout and coach him through the interview. We would film him using a second webcam, so that we're not limited by the hangout's limited video quality. So we scheduled a hangout. Preston was in the room where he keeps his guitars, he said he could get some nice back and side lighting from the windows (did I mention that Preston's also a great still photographer?). Catherine set up the webcam, and we had her adjust it for composition and headroom, making sure Preston was seated where we could see him and the guitar he was holding. Once everything was in place, Catherine started to record using the second webcam. We asked Preston leading questions to get him to cover the talking points. Since he was speaking to us, he was speaking directly to camera, and this gave us the genuineness we wanted. It wasn't easy to get a perfect take for each talking point. Sometimes there would be pauses or stammers, sometimes they would start off great but stop prematurely, or not conclude smoothly. The takes came out different every time, and at different energy levels. We needed takes that would all work together. We also asked Preston to just read the script from start to finish, exactly as written. That gave us plenty of material for when when there was b-roll on screen. Catherine stopped and restarted the recording a few times to keep the file sizes manageable. When we were finished, Catherine put the files on Google Drive so that I could download them from there. On our end, we created the backbone of the story by using the best takes from the interview that worked together, making sure the ones where he was looking at the camera were particularly good. Then we laid in the b-roll. I wanted to showcase his playing for a few seconds before you ever hear him talking. That's what will capture your attention at the beginning, if you're the right audience. The rest was straightforward: show Preston on screen, but not too much, let his work do its work visually. It was a unique learning experience. The audio quality for his VO wasn't great. Since he's got all that audio gear, we should have recorded the audio separately and delivered it for editing uncompressed. The webcam software didn't do such a great job with it, and on some clips it was even a few seconds out of sync. Also, when we adjusted his headroom, we were using the hangout view, not the recording webcam, and we lost the top of his head. These aren't show stoppers, but they're easy targets for the next time we do anything like this.